Inder Loves Folk Art: Teeny tiny knickers. What do you do when your little girl starts using the potty, completely of her own accord, a month before her second birthday? You sew up some undies, of course! I didn't use my trusty ThatDarnKat pattern for these, because that pattern starts at size 2 and Maggie is a tiny little thing. 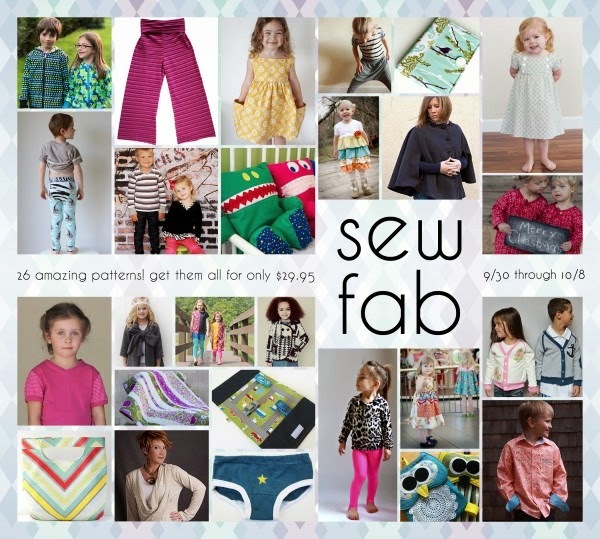 Instead, I used the undies pattern that came with the Sew Fab e-Bundle in 2013. It's on the bottom row, left of center. Unfortunately this pattern, made by From The Red Kitchen, does not appear to be available anymore. This is a shame, because I really like it! And it starts at size 12-18 months! Which would have seemed ridiculous and bordering on hippy-dippy "Elimination Communication"** when I was potty training Joe, since he was such a big boy and trained relatively late, but with Maggie being such a small little peanut, makes a ton of sense to me now. Yes, she's hanging off the table. Now she can "hang out" in just her undies, just like her brother! For the first pair, I used ribbing on the leg openings, and it turned out cute, but a little baggy as you can see in the photo above. So for subsequent pairs I used strips of cotton lycra with better recovery. Many blurry action shots of my baby's adorable bottom and plump thighs were taken. This is what Maggie's hair looks like after it has been combed, conditioned, and allow to air dry. So curly! Too bad it never lasts. By the next morning, it's a rat's nest once again. A friend of mine gave me a couple scraps of Heather Ross strawberry printed jersey, and even though they were small, there was easily enough for two pairs of undies! Tiny STRAWBERRY knickers, people! Have you ever seen anything cuter? Seriously, a 12" square of jersey can make a pair of undies in this tiny size. If you mix several fabrics together, you can really use up some small scraps. In all, I made seven pairs. 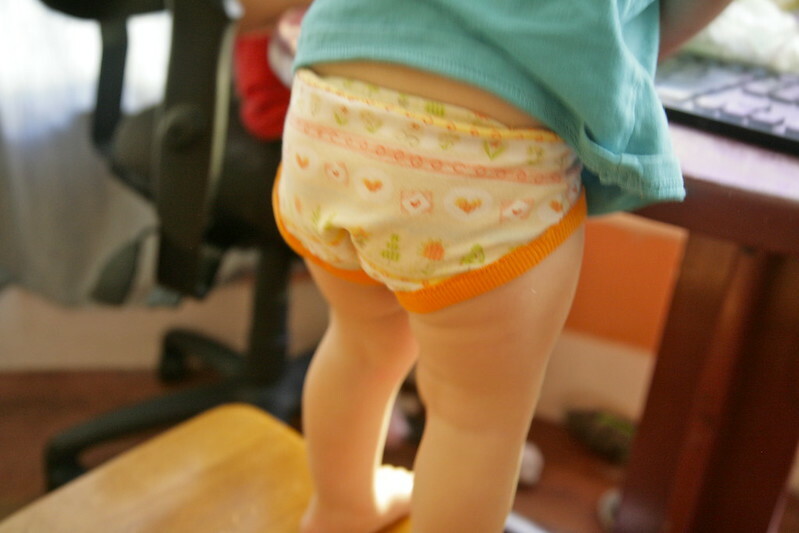 A little insane, especially given that (a) Maggie is still wearing diapers at night, for naps, and out of the house generally - she is far from accident free; and (b) She does best using the potty when she's allowed to run around completely naked. But making underwear for kids is such a great way to use up scraps, it's fun and fast, and they look so freaking cute on little tushies. Pinch, pinch, pinch! And Maggie's USING THE POTTY!! My big girl! How could I resist? *Remember, Joe was well past his third birthday when he began to pottytrain. When my mother assured me that everyone starts using the toilet eventually, no one goes to college in diapers, I admit, I entertained real and pressing doubts. But indeed she was right, and Joe figured it out almost overnight, with almost no accidents. It turns out my mother was also right when she foretold that Maggie would start to pottytrain earlier and without as much work, because "you know, girls are easier." All true! ** Any note of snark in my description of this widely used and apparently quite effective for many method of potty learning comes from pure and unadulterated envy, see comment above. Nothing cuter than tiny underwear! And hooray for early potty training- go Maggie! I bought that pattern bundle so I'll give the Red Kitchen ones a try and compare it to the ThatDarnKat ones. E needs some new underwear this summer. I'll keep your lycra recommendation in mind. Yes! Can't wait to see yours! Her pattern suggests using white cotton undershirts, and turning the binding entirely to the outside. I didn't think that would work at all, honestly, there would be no stretch around the leg openings at all! That is my biggest complaint about this pattern! But with some snappy poppy stretchy leg bindings, the fit of these is very good. I used 2" lycra strips, stretched on a bit, sewn with the raw edge on the outside. same story here... the boy is running around in the house bare bottomed, using the potty all by himself and emptying it into the toilet himself without making a mess! I love this kid. he won't tell me though if he has to go, so undies are not yet working. he can't take them off by himself fast enough. but heck, I had to go to countless stores to find boy undies in size 2, everywhere they started in size 4... I did find some but I spend more money on 5 pairs than I ever spend on my own underwear. I guess nobody expecting early potty goers these days... out of the house we still use diapers and during the night, that is if the little man agrees to wear them. thank God for tile floors and summer heat. makes all that laundry and clean up much easier! Wow, that's awesome! I think having an older sib makes such a difference! Maggie wants to do everything like Joe - including using the potty! Ah they are all just their own people, aren't they? Nice work Maggie if she can save you a year of nappies/diapers! Little tiny strawberry undies sure are cute! Congratulations to you on the sewing and for Maggie on having a go at this one of life's milestones! 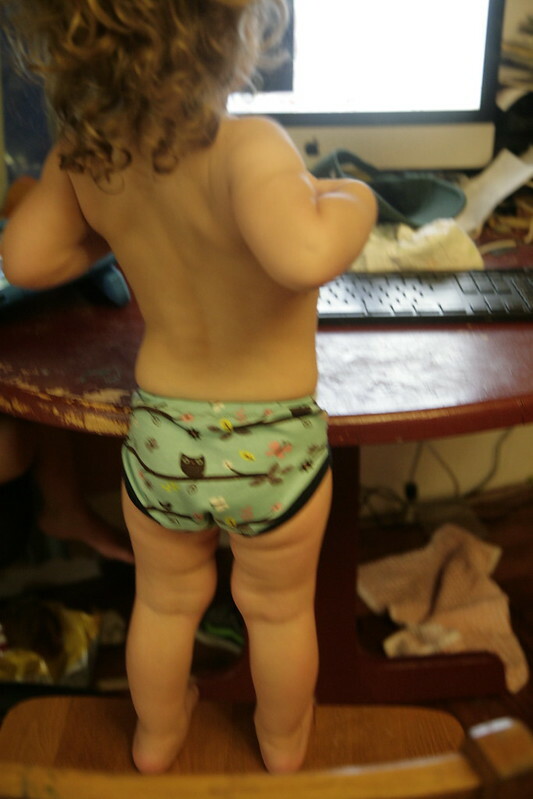 Yes, I admit I enjoyed making these primarily because they are SO FREAKING ADORABLE on her little bottom, even if she can't really properly wear undies full time for a while. Well done, Maggie! Enjoy your lovely mommy-mades! She wants to do everything like her brother! I joke that if she does potty train early, it will be because Joe potty trained her! It's amazing what looking up to an older sib can do! Even if he's not always the nicest. Recently, she was pounding on the bathroom door while Joe was sitting on the pot, and Joe yelled roughly, "Go away! Go poop in your diaper, Maggie." I went into paroxysms trying not to laugh aloud! But of course she wants to be like her brother! Well, this is pretty much the cutest thing I have ever seen! And I love the fabric you used! So much cuter than what you can find in the stores! So awesome, Inder. Jude and Indigo both potty trained overnight at 3 1/2. Tia potty trained herself at 2 which completely floored me! Iris tried to potty train herself at 2 1/2 but she still has a lot of accidents and it's definitively not making life easier. But hopefully she will figure it out soon. Talking to mothers of more than one (or more than two) children is always so refreshing, because what I always hear is that "each child is different"! And that means it's not my fault! Haha! So nice. And true! They really are all different.